Do you ever feel that you are so busy pleasing the "powers that be" that you never have time to focus on the work that you want to do? Does teaching feel more like fulfilling the requirements of your evaluation system than actually making a difference in students' lives? Do you dread your next formal observation because you're worried the feedback you get will be either irrelevant or unfair? If you want to take back control over your own teaching, then this webinar will empower you to do just that. 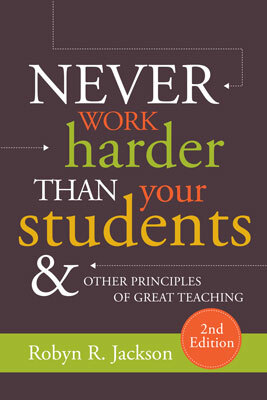 Join Robyn Jackson, author of Never Work Harder Than Your Students and Other Principles of Great Teaching, 2nd Edition, as she shows you how to use the Seven Principles of Great Teaching to take charge of your own professional growth—from mapping out your own professional growth plan to advocating for yourself during your next formal observation. Robyn R. Jackson, PhD, is a former high school teacher and middle school administrator. She is the founder and president of Mindsteps Inc., a professional development firm for teachers and administrators that provides workshops and materials designed to help any teacher reach every student.